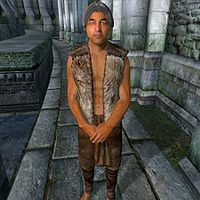 Fralav the Faker is an Imperial commoner who tries to get by as a beggar in the Elven Gardens District of the Imperial City. His bedroll is located in the backyard behind Fathis Ules' house and he sleeps there every night between 10pm and 6am. When he wakes up, he walks the short distance to the southern gate, where he tries his luck until midday. He then heads to the dead end in the northern part of town for another six hours of begging. Assuming he has found anything to eat, he will head back to his bedroll at 6pm and enjoy his dinner seated at Fathis Ules' chest. If not, he will just wander around the center of the district. At 8pm, he gets up and begs for another two hours in the same area until his bedtime. Fralav is infected with the disease Black-Heart Blight and you can be infected should you engage him in combat. The huntsman vest and matching leather pants he wears reflect his low social status, and the insignificant amount of gold he carries furthers his standing. He is so poor he doesn't even own his bedroll, his only other material possession being his food sack nearby. He is the only NPC that carries the Black Heart Blight disease, which may be familiar to Morrowind players. This page was last modified on 26 December 2017, at 21:53.